It's only February and already two of the influential teachers in my life have passed away. In January, my childhood rabbi (Rabbi Efry Spectre) passed away, and yesterday I learned that Rabbi Moshe Tutnauer died. I first met "King Tut," as he was known, in 1996 when I was working at Congregation Shaarey Zedek in Southfield, Michigan. 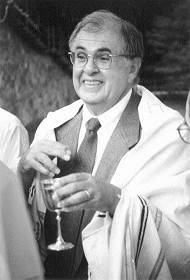 Rabbi Tutnauer was serving as the interim rabbi. It was a role he filled often in many synagogues around the country. When a synagogue needed a rabbi for a year or two while they readied themselves to conduct a search for a permanent rabbi, he would "hold down the fort." It might not have been a requirement for an interim post, but no matter where his travels took him, he always seemed to create lifelong friendships and have meaningful impacts on so many. He told me that he and his wife Marjorie live in the Jerusalem neighborhood of French Hill, which is where my mother's close friend lives. It so happened that my mom's friend was in town visiting and so I asked her if she knew a rabbi from her neighborhood by the name of "Tutnauer." She replied that of course she knew him and that her son (who's my age) played basketball with Rabbi Tutnauer whenever he was home from the Navy on the weekends (he served on a submarine). Her son was a 6-foot 4-inches, 20-year-old who played for his high school basketball team. I told her that it couldn't be the same rabbi who plays basketball because this rabbi is in his late 60's and I couldn't imagine him playing basketball with a bunch of young, tough Israeli soldiers. Boy, was I wrong! It wasn't long after King Tut arrived in Detroit that he asked me to "shoot hoop" with him. He arranged for the synagogue's maintenance workers to erect a basketball hoop behind the synagogue. Every day, he'd go out back and shoot baskets with the maintenance guys. We played games of "HORSE" and 2-on-2, and sometimes we just shot baskets and talked. He was a great player (and not just for someone his age). He was also a huge fan of professional basketball. To this day, I'm convinced he took the interim job here in Detroit because the owner of the Detroit Pistons was a member of the synagogue and King Tut knew he could get tickets to any game he wanted -- and he did. What amazed me about Rabbi Tutnauer was how many lessons he had prepared on various subjects. He created these 4-page source sheets, placed each one in a plastic folder, and had each folder attached to his office wall with Velcro. His temporary office was decorated with his files. He taught from these source sheets in each synagogue he served in as an interim rabbi. To this day, I still use his 4-page handout on the intricacies of the Jewish calendar. I spent a lot of time learning from Rabbi Tutnauer when he was in Detroit. A few years before his stint as Interim Rabbi at Shaarey Zedek, he had been a scholar-in-residence for the Detroit area's Conservative Jewish community. I didn't meet him during that month, but I do recall my late grandfather mentioning how much he enjoyed studying with him. One fond memory I have of him is the weekend he spent in East Lansing as a scholar-in-residence at the Michigan State University Hillel center, where I was active. I took every opportunity I could during that weekend to talk with him and learn from him. During his stay in Detroit, he prepared me for my rabbinical school interview and was extremely helpful in providing assistance with my admissions essays. There's a policy that interim rabbis are not allowed to be offered full-time positions at synagogues. I wouldn't be surprised if this rule was established because of Moshe Tutnauer, not that he would ever leave his beloved Jerusalem. Of course, each synagogue that he served convinced him to stay for a second year as interim rabbi. For many years after his time in Detroit, I stayed in contact with the Tutnauers via email. Moshe would send out various updates on his growing family (In addition to his biological children, he and Marjorie adopted several Ethiopian children over the years). The last time I saw him was in December 2002 at the Conservative synagogue in his French Hill neighborhood in Jerusalem. When he spotted me in the synagogue, he motioned for me to meet him outside. He greeted me with a bear hug and inquired about dozens of Detroit families (he stayed in touch with everyone). I mentioned that I had just read the book "The New Rabbi," about the search for a new senior rabbi at Har Zion Temple in Philly, in which an entire chapter of the book is dedicated to "King Tut," who had served as the interim rabbi there following Rabbi Gerald Wolpe's retirement. He gave me the inside scoop on the latest shenanigans at Har Zion and told me some of his experiences that didn't make it into the book. At the time, I was in rabbinical school and serving an internship at a large synagogue in New Jersey. I was in Israel on vacation with my wife and had planned to take the time on this Sabbath morning to actually sit in synagogue and pray (something I didn't have the chance to do on an average Saturday morning, as I was normally teaching or giving sermons). But I didn't mind that I spent the bulk of that morning standing outside in beautiful Jerusalem shmoozing and learning from one of the greatest rabbis of our time. I am such a better person, and certainly a better rabbi, for having known him. May the memory of Rabbi Moshe Tutnauer, a scholar, Zionist, mensch, and basketball star, endure for blessings. Dear Jason - did you know that Rav Moshe also did a weekend at Agudath that people still talk about as the BEST scholar in residence ever! It was before your time...Also Lesley Roxin's ex was like an adopted son in Jerusalem to R. Moshe. And when Roxin was in the Israeli army, he too played many games of basketball with R. Moshe, may he rest in peace after touching so many lives in such a positive way. thank you so much for letting me know. I had heard of his illness but didn't realize things had gotten this bad. what a terrible loss. what a wonderful, wonderful man and rabbi. I'm honored to have known him and played basketball with him, and I'm glad a little part of him will live on in the book--which I never could have written without him. I had the honor of becoming his last Bat Mitvah before Rabbi Tut and his family made aliyah. We lived on the same street and would walk home often from shul. I went to school with his sons, and enjoyed watching them play basketball. I last spent time with him in Israel a few years ago. I am so glad to have been taught and inspired by him, and to have him and his family in my life. Rabbi Reuven Taft wrote a lovely tribute in memory of Rabbi Moshe Tutnauer for the Jewish Journal of Los Angeles. He also published it in the Phoenix Jewish Times. Back in the 70's Rabbi Reuven Taft was our Cantor while Rabbi Tut was our Rabbi.